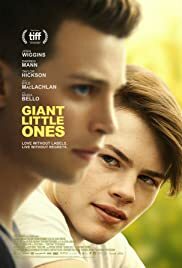 GIANT LITLLE ONES is the second feature from Vancouver filmmaker Keith Behrman (FLOWER & GARNET) that has already won accolades including three DGC (Directors Guild of Canada) nominations and the Vancouver Film Critics Circle’s BEST Screenplay for a Canadian film. It also made this year’s Canada’s Top 10. It is a film about youth – and one that captures the bullying and expectations of both upon youth. The film has a gay slant and one that straight youth cannot accept, even in these days of gay acceptance. The film opens with the protagonist, Franky Winter (Josh Wiggins) riding his bicycle around his neighbourhood. It is a great scene that celebrates writer/director Behrman’s love for filmmaking. The plot and story is not yet established and the camera just spans and moves around in exhilaration as if to celebrate the joys of filming. And the joy is catching. The audience gets to enjoy this spanning of the landscape before the story settles on a more serious subject. What is seen on screen could very well be a suburb of a Canadian or American city – but the setting is left ambiguous. But one would wish that since it is a Canadian film, that the setting would be more deliberately stated as Canadian. Money talks – and an American setting means a bigger target audience. The story is about labelling. A straight swim team member is labeled as gay and the story concerns on what he does to survive the labelling. Things do not help that his father (Kyle MacLachlan of BLUE VELVET) has recently come out gay and his mother (Maria Bello who also co-produced this film), has written the book “Whatever… Love Is Love: Questioning the Labels We Give Ourselves”. It all started off at Franky’s 17th birthday party when his girlfriend, Natasha (Taylor Hickson) leaves after the incident in which they both fail to lose their virginity. Her brother, Ballas (Darren Mann) also on Franky’s swim team spreads the rumour that Franky may be gay. That is when all the trouble starts. And continues through the film. Behrman is brave enough to attempt certain daring lines in his script. In one key family scene, when Frank is told his visiting gay father has been told of the incident, he storms out of the room screaming: “I am not f***ing gay!” The words that might offend a portion of the gay audience are left intact to emphasize the emotions Franky is undergoing. Credit to Behrman. The film also shows the teens behaving maturely, as adults thug still dealing with teen issues. This aspect of the film shows that teens demand more respect as adults. Excellent performances are delivered by all the young performers aided by Bello and MacLachlan. MacLachlan does not have many scenes but he creates quite the impact in those he is in. So how does it all end? Is there a message for the audience? Revealing more would definitely be a spoiler to what is an excellent paced and remarkably moving film about coming-of-age, acceptance, family acceptance and a whole lot more issues.